Surrounded by one of the largest petrochemical compounds in Argentina, a highly polluted river that brings the toxic waste of tanneries and other industries, a hazardous and largely unsupervised waste incinerator, and an unmonitored landfill, Flammable’s soil, air, and water are contaminated with lead, chromium, benzene, and other chemicals. So are its nearly five thousand sickened and frail inhabitants. How do poor people make sense of and cope with toxic pollution? Why do they fail to understand what is objectively a clear and present danger? 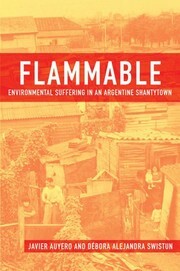 How are perceptions and misperceptions shared within a community?Based on archival research and two and a half years of collaborative ethnographic fieldwork in Flammable, this book examines the lived experiences of environmental suffering. Despite clear evidence to the contrary, residents allow themselves to doubt or even deny the hard facts of industrial pollution. This happens, the authors argue, through a “labor of confusion” enabled by state officials who frequently raise the issue of relocation and just as frequently suspend it; by the companies who fund local health care but assert that the area is unfit for human residence; by doctors who say the illnesses are no different from anywhere else but tell mothers they must leave the neighborhood if their families are to be cured; by journalists who randomly appear and focus on the most extreme aspects of life there; and by lawyers who encourage residents to hold out for a settlement. These contradictory actions, advice, and information work together to shape the confused experience of living in danger and ultimately translates into a long, ineffective, and uncertain waiting time, a time dictated by powerful interests and shared by all marginalized groups.With luminous and vivid descriptions of everyday life in the neighborhood, Auyero and Swistun depict this on-going slow motion human and environmental disaster and dissect the manifold ways in which it is experienced by Flammable residents.